A fascinating series of paintings from the 1950s have recently been put on display in Salts Mill’s Gallery 2 – well worth a visit, both for those wanting to appreciate the work of Leeds-based artist Henry Carr, RA, and for those wanting to see the sequence of textile production depicted in art form. The way the paintings were originally commissioned is interesting. In the early 1950s the directors of Salts Mill asked Carr – a well known war artist with more than 70 of his works in the Imperial War Museum Collection – to paint a portrait of Managing Director R. W. Gould, to celebrate the latter’s golden wedding in 1951. The result was sufficiently successful to lead the directors to further commission a series of 14 murals, depicting the individual stages of textile production, from sheep shearing through to the burling and mending and final cloth folding of the finished product. 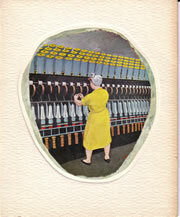 Carr worked on the paintings over a two year period from 1957 to 1959, making many drawings during visits to the mill. Three of the paintings were originally hung in a small vestibule just off the Mill’s main entrance hall; the rest being displayed on the staircase to the first floor. Some of the paintings were subsequently used as illustrations on the official Christmas cards of Salts (Saltaire) Ltd. Following cessation of the Mill’s textile life in the 1980s, the paintings languished for many years in backrooms, but recent and expert restoration work has recaptured the vitality and colour of Carr’s work. The conservation of such an attractive and important feature of the Mill’s heritage, and the public showing of the work, is to be greatly applauded. The paintings can be viewed during the Mill’s normal opening hours.